Each year, members of the Task Force review and select one or more, age and grade level appropriate books for children and youth which focus on diversity, resolving differences, creating respect and community building. Copies of the book (or books) are then contributed to the libraries of the eleven elementary schools, the four Middle Schools and the two high schools in the Hamblen County School District. In addition, we place a copy of each book chosen in the Morristown-Hamblen Library. This year’s book selection for Elementary Schools is “The Flat People and the Round People” written by local author, Claudia Ware. 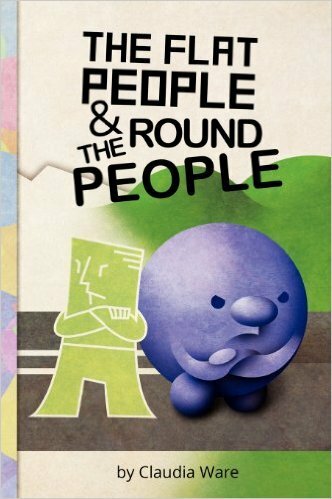 This is a beautifully illustrated book in which the flat people and the round people live on opposite sides on town and do not speak to one another because they are different. The story unfolds when one brave little boy decides to cross over to the other side of town. High School teaching films, for October and November, click here. The attached, pdf list is of seven, Native American Films for High School Teachers. Please note that there are books (and films) on these lists which are beloved classics and which may be cherished by many. There are also books (and films) listed for High School students or adults which may be controversial and which do include violence of many types. Some may contain offensive language or situations. The history of people is a history of those in power perpetuating violence on those who are not in power. This can be in the form of language and bullying. It can be physical, beatings, incarceration, segregating people in certain areas or on reservations. It can include the rebellion of people against oppression and that is often violent. It includes the closing of economic opportunity and the rejection of certain cultural behaviors important to people outside the “us.” This is the situation of those who are different from the insider culture. For others, the situation itself or the perspective presented by the book may be challenging or even disturbing. In regard to the adult reading list, we seek to list contemporary reading of note. These will not be easy reading for anyone. We urge readers not to bypass these books. Instead, we urge readers to gather for book discussions in order to process what you are reading. The reality of our world is that in order to build community and the quality of life for all, we must identify our differences and confront the challenges that are part of the different cultural pools in which we swim.